Gas ovens, gas stoves, gas cook-tops, gas hotplates, gas room heaters and gas hot water systems can be very complicated to install or repair. They require many interconnecting pieces and parts to be attached. It can also be very dangerous if done incorrectly. You need a fully qualified gas fitter, one that can supply you with a certificate of compliance upon installation. Metropolitan Plumbing gas fitters have had extensive training in every aspect of gas fitting, including installing and repairing. So, if you need a faulty gas oven looked at or a new gas hotplate put in, look no further! Our gas fitters service 24/7, even public holidays. We’ll send a licensed gas plumber promptly at the time you were given, or within the hour* in an emergency. All you need to do is phone us on 1300 367 333, or click over to our online plumber booking form. Are you able to install my new gas appliance? Yes, Absolutely! Gas ovens, gas stoves, new gas hotplates, natural gas BBQ’s – one of our gas fitters will be able to install and commission any kitchen gas appliance you may have. We are also to undertake installations of gas heaters or gas hot water systems. Your attending gas fitter can either install your new gas cooking appliance where the old one was, or extend your gas pipe work to create a new gas outlet in a different location. The same goes for if you already have a gas oven or gas stove, but would just like it relocated to a more desirable position. We can have one of our gas fitting professionals around to your property to simply move your existing gas cooking appliance, it’s totally up to you. For any gas fitting work you need done, Metropolitan Plumbing is your one stop shop. Are you able to repair my existing gas appliances? 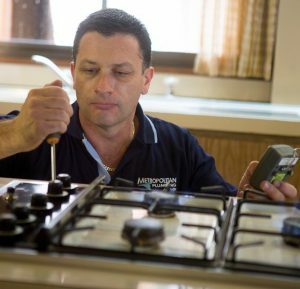 At Metropolitan Plumbing, all of our gas fitters have every tool and most spare parts required to repair all types and makes of faulty gas appliances. We do recommend that you have read your user’s manual if it is a new appliance before contacting us. We do sometimes arrive at a customer’s home or business only to find there was nothing wrong with their gas cooking appliance; the customer simply did not know how to use it. Some gas stoves require an electricity connection as well as a gas connection, while some gas ovens won’t begin to heat up until the timer has been set, so it’s always best to familiarise yourself with the operation of your specific gas unit before calling one of our gas fitters. If you’ve got a faulty gas oven, gas stove, gas cooktop or gas hotplate, contact us straight away and we’ll be able to send one of our plumbers to your property to provide a repair. Regardless of what’s wrong with it, what type, make or model, our gas fitters have the tools, training, skills and experience to repair any malfunctioning gas cooking appliance. If you experience issues with any gas appliance in your home or office call us anytime of the day or night. Gas is a highly flammable substance and it is always better to be safe than sorry!